Badger basket's modern baby changing table with six baskets is a smartly organized and endlessly practical place for diaper changing and dressing your baby. Three large and three small baskets hold diapers, wipes, creams, blankets, toys, and more. Pull-out baskets glide smoothly on support rails and are fully removable so you can find small items that get buried at the back of the drawer. Basket handles make them easy to open one handed during diaper changes. Insert your own nameplates into the pockets on the front of each basket so you know what's stored inside. Reversible, two-color baskets make it easy to customize the look of your nursery in numerous combinations. Flip the baskets around so all the large are the same color, and the small baskets are another. Have fun with a checkerboard or random pattern. If you don't use the baskets, there is a bottom shelf and a tall, open storage area where you can stack blankets, stow a large box of diapers, or place your diaper pail. The baskets can be used separately from the table to organize a closet, or fold them flat for storage if they are not being used. This changing table also features safety rails around the top and includes a comfy foam changing pad and a safety belt. Metal support bar beneath the changing surface provides additional stability. When your toddler outgrows this table, it becomes a handy storage solution for training pants, toys, stuffed animals, mittens, blankets, coloring books, school papers, and more. Table is reversible so the large/small baskets can be either on the left or right. 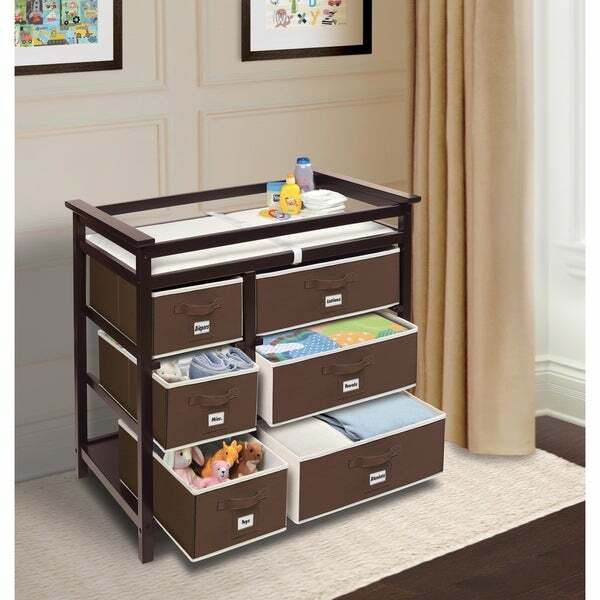 Measurements: overall changing table measures 34.25"L x 20.75"W x 34.25"H. Width not including top trim: 19 inches. Large baskets: 18.5"L x 17"W x 7"H. Small baskets: 10"L x 17"W x 7"H. Height clearance from the floor to bottom rail: 3 inches. Changing area: 31"L x 17.5"W, 4.25"H at the side rails, 5"H at the end panels (without changing pad in place). Changing pad: 30"L x 16.5"W x 0.75 inch h. If large baskets are removed, shelf area is 18.75"L (17.25"L between the basket tracks) x 17.5"W x 28"H. If small baskets are removed, shelf area is 10.25"L (8.75"L between the basket tracks) x 17.5"W x 28"H. Assembled weight: 28.6 lbs. All measurements approximate. Care instructions: wipe the table and changing pad clean with a damp cloth and mild soap as needed and dry thoroughly. Spot clean baskets as needed. Never immerse the baskets in water due to the internal cardboard support panels. Safety information: changing table is for use with children weighing up to 30 lbs (13.6 kg). Adult assembly required. Illustrated assembly instructions included. Meets all currently applicable safety testing standards. Warranty: product includes a limited warranty of 30 days parts to the original purchaser. Props/accessories shown are for illustration purposes only and are not included with the product. Actual color/finish may vary slightly from screen display. Basket fabric is 80% polyester/20% cotton on the exterior, and non-woven fabric on the interior and bottom board. Changing pad is polyurethane foam covered with peva vinyl. Adjustable, nylon safety belt has a plastic buckle. All paints and finishes are non-toxic. Product may vary slightly from shown and described. Materials: table frame is made with multi-layer wood and mdf with veneer. Color: gray. Assembled Size: 34.25"x20.75"x34.5", Country Of Origin: Imported. Needs Assembly: Yes. Dimensions 34.25 In. X 20.75 In. X 34.25 In. "does this come in black"
"I want to get grey frame and white baskets. Is that possible? If yes how to order it? I didn’t see any option to chose the color of the baskets. Thank you"